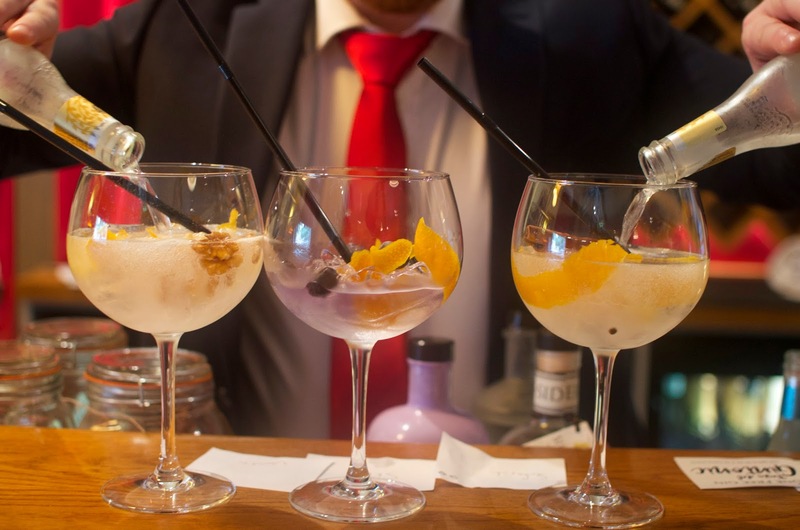 Last weekend I was kindly invited to the Fiesta del Gintonic at Tapa in Leith. Anyone who knows me knows I enjoy a good gin and tonic, but I knew very little about Spanish gin. Except that it is called ginebra (from ordering many while on holiday in Mallorca and Tenerife). I was pretty excited for the event as it was right up my street. When we first arrived at the restaurant, we were greeted with a wee goodie bag and explained how the afternoon would work. The bar is just by the entrance, but for the first time in my life, it was not the first stop of the day. Instead we were advised to make our way around the various booths set up by brands/representatives of the gins for a little brief on the drink and a taster. Near the bar, the chef was getting a start on cooking up a paella so you were immediately hit with the most delicious smell. There was also a huge leg of Jamon Iberico being cut, an olive oil table, as well as Fever-tree Tonic's table and the first gin. The rest of the gin booths were down in the back section of the restaurant. I'm pretty familiar with Fever-tree tonic, but I never realised just how many drinks they made. I particularly liked the Mediterranean tonic, which I will definitely need to track down sometime. So we headed straight on to the gin tasting itself. Each gin was paired up with a Fever-tree tonic and a garnish, so most of the booths let you taste the gin straight yourself, then try it with the mixer and garnish. That way you could pick your favourite at the bar at the end. Valentia is a premium gin that hails from the Sierra Nevada mountains of Granada. It had notes of citrus that paired really nicely with its garnish of grapefruit and rosemary. It was also paired up with the Fever-tree Mediterranean tonic which went really nicely with the rosemary. It was a great way to start the tasting and definitely up there in my top five gins of the evening. While I didn't immediately recognise Larios, my friend did. Rightly so as the brand representative let us know it is probably the most common gin in Spain, and quite often your house gin. While it was by far the cheapest gin in the room, it didn't actually taste like it. It is double distilled and made to the London dry gin recipe with juniper, coriander and orange peel. It is smooth and dry, but definitely not too dry, with floral and citrus notes. At the Larios table there were three different types of Larios gin. The first was your standard, the second was a premium Larios that is distilled with 12 different botanicals including juniper, nutmeg, angelica root, coriander, lemon, orange, tangerine, mandarin, clementine, grapefruit, lime and orange blossom. A stronger citrus taste, Larios 12 was garnished with twists of lemon and orange. Larios 12 was one of my favourites, it had a really rich but still drinkable flavour. There was also a Larios Rose, a strawberry infused gin. Unlike Edinburgh Gin's flavoured gin liqueurs, this flavoured gin still remains a gin with an alcoholic content of 37.5%. What was most striking was the smell of the strawberries coming from the gin, but the taste was much smoother and subtle. It's not the kind of thing I could drink all night, but would make for a great cocktail. The garnish of fresh strawberry and cucumber really enhanced the flavour. This was probably my least favourite gin of the day, but it was no surprise why as olives, rosemary, thyme and basil are included in its botanicals (and I'm not a fan of olives). It has a super unique taste and the olive really comes through, so if you're into that you'll love Gin Mare. It is definitely a savoury gin, and I normally prefer my gins with more citrus tones. It was served of course with the Mediterranean tonic with a twist of lemon and spring of thyme. Siderit and Siderit Hibiscus were also a big hit at the tasting. Siderit is a sweet and floral London Dry gin made with hibiscus, mandarin bark and pink peppercorn. It had a really delicious sweetness to it. The Siderit Hibiscus uses the same botanicals as its London Dry version, but really concentrates on that hibiscus flavour. The bright pink colour of this gin comes straight from the hibiscus flower and despite the flavour it retains its high alcohol percentage (43%). It had a delicately sweet flavour but I think we did in the end prefer the London Dry Siderit (which was probably our second favourite of the day). Spoiler alert: this was definitely my favourite... and sadly probably one of the hardest to find in the UK. Nordes is just up my street as a soft, sweet gin from Galicia distilled from Albarino grabes with 12 Botanicals including peppermint, hibiscus and lemongrass. It was paired very simply with Fevertree Indian tonic, lemon, mint and cardamom seeds. It was the one I picked for my full-sized drink at the end of the tasting, and I even ended up having another glass or two after while enjoying paella later in the afternoon. This gin is so good that they did not have a brand representative to promote it, a Spanish woman contacted Tapa when they were organising the event and was such a fan of the gin that she asked to promote it at the festival. Before we even knew that, my friend and I had thought she was one of the most knowledgable and passionate about her gin! Vones is another London Dry that is distilled four times in traditional copper stills. It uses 11 botanicals but what stands out is its use of chestnut. The chestnut makes the taste pretty unique, giving it a sweet and creamy taste with a bit of a bitter aftertaste. It was garnished with orange and walnuts to enhance its unique flavour. This one stood out as it has a super old fashioned bottle and label which was quite interesting. It is only made in Menorca and is distilled with grapes, orange and lots of juniper. This one was paired up with the Fevertree Sicilian Lemonade which as delicious as it is, maybe overpowered the gin a little too much. Sikkim is definitely the type of gin you'll want on your bar cart for the look alone. Each bottle is super distinctive in a bright pastel colour. The one at the tasting was Bilberry flavour so a proper pastel purple/lilac bottle. I have seen Sikkim before and knew it came in a couple other colours and flavours, each bottle as bright as the next. I had no idea it was a Spanish gin though! I personally liked the taste of the bilberry (a type of blueberry) but my friend wasn't as keen. Unlike flavoured Edinburgh Gins, like the Larios Rose, the Sikkim Bilberry retained its high percentage of alcohol content despite its strong, sweet flavour. I'd definitely drink it again, maybe not as a drink you can stick to all night, but one when you just fancy one or two (as it is probably a touch too sweet for drinking all night long in my opinion). This was the most expensive gin of the evening, it is quite limited in quantity as it can only be distilled during a full moon, twelve times a year. It contains a whopping 21 botanicals which make for a rich and varied taste. It is the first gin to be made from Muscat grapes, more commonly used in wine production. It was served in a classic way with Indian tonic, dehydrated orange and twists of lemon so you can really taste all the different botanicals. After the gin tasting you could head over to the bar for a full-sized of your favourite (I went for the Nordes... quite a few times actually). By this point the head-chef had a delicious paella on the go and there was a live Spanish music act. There were also some delicious canapes going round my favourite were the blue cheese croquettes and the oxtail croquettes. 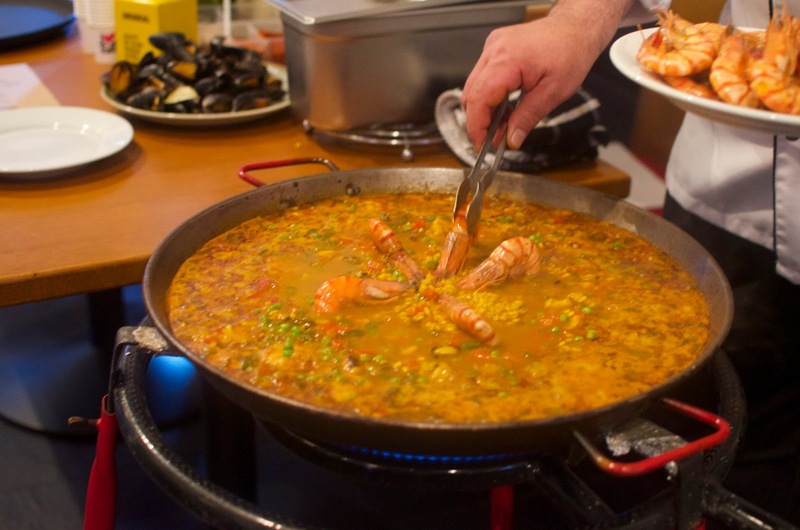 The seafood paella was great for soaking up the afternoon's gin, and was filled with delicious prawns and mussels. Overall it was a really unique and fun afternoon, I feel like the next time I go to Spain I will know exactly what gins to look out for. I'm also really looking forward to heading back to Tapa for a meal to accompany my new favourite gin. Thank you again to team Tapa for inviting me along. To see their full menu, check out their website here and take a look at their drinks menu to see which gins you will find there.